The PXL series of knives brings together a selection of models which are suited for everyday use. The PXLMM is a knife which can be described as modern and which can easily carry out those tasks which are done on a daily basis. It also carries the maxim EDC or Every Day Carry. It has a stainless steel adjustable blade which is made from Fallkniven’s celebrated 3G steel which surely needs no introduction. This results in a blade which will remain sharp if maintained properly with a little bit of sharpening every now and again, preferable using one of Fallkniven’s celebrated sharpening whetstones or the DC3 and DC4. 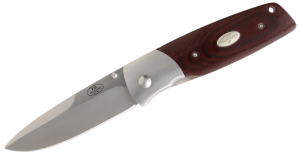 The PXLMM comes with a handle that is probably one of the best in its field – the Maroon Micarta. Apart from sporting an almost blood coloured maroon shade, the material is almost indestructible and feel extremely well to handle although there are othe materials which are also being considered for the near future. Another useful feature on the PXLMM is a safe and extremely strong liner bladelock which allows you to open the blade with one hand only, if you are right handed or left handed. The knife is also offered with a clip which enables easy and comfortable handling of the knife. The PXLMM is a top quality folding knife apart from being very sharp so you should be careful when using it. The knife is 7.83 inches long when open and has a folding length of 4.37 inches long. With a blade length of 3.46 inches and a thickness of 3.5 mm you can rest assured that this will perform very well in almost all situations. The knife weighs just 176 grammes so it is also very comfortable to hold and manoeuvre. The liner lock holds the knife in its position very well indeed so you can rest assured that the PXLMM is a knife to be reckoned with.